I like that. I favour "dreamt" and "leapt" (or should that be "lept"?) over "dreamed" and "dreamt", myself. Can't give any reason why, though. 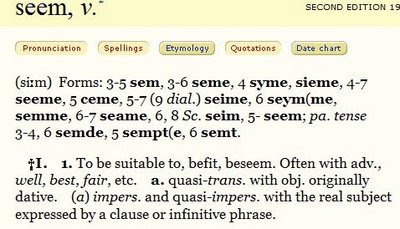 I've not heard "sempt" from living in Yorkshire. I looked in the Upton/Parry/Widdowson volume of SED and in the Dictionary of the Scots Language, and didn't find it anywhere. That's a new entry for me. However, I have heard "tret" frequently. Similar forms include "selt" (sold) and "telt" (told), which extend from Yorkshire northwards into Scotland. It's good to see a bit of Yorkshire dialect on the blog, although I should point out that Grimethorpe, as an isolated ex-pit village, is likely to be very conservative in comparison to the rest of West/South Yorkshire speech. And Jack Windsor Lewis points out (p.c.) that Americans have "pled" as the past tense of "plead". BrE is pretty vast and wide, I had studied it before but never to the depths of the many different ways some words can be pronounced or spoken. In deed much more deep and rich than AmE.